In 2018, a peaceful protest movement brought down Armenia’s semiauthoritarian government and ushered in a new political era, the culmination of a long struggle for national pride, self-determination, and democracy. Russia’s ruling elite have used corruption not only to line their own pockets, but also as a tool of domestic political control and global power projection. The Kremlin Emboldened: What Is Putinism? A review of China’s Eurasian Century? Political and Strategic Implications of the Belt and Road Initiative by Nadège Rolland. Turkmenistan’s authoritarian president Gurbanguly Berdimuhammedov attempted to use sham democratic elections in February 2017 to bolster his legitimacy both at home and abroad. A review of Dictators Without Borders: Power and Money in Central Asia by Alexander Cooley and John Heathershaw. Much can be done to uproot graft when a major event such as the Rose Revolution sweeps in a determined new team on a wave of massive public support. The Kremlin is now bringing to the rest of the world the kind of propaganda and conspiracy theories it has been churning out at home. January 2014 marks the tenth anniversary of Afghanistan’s constitution. In what areas has it succeeded or failed? Judging by its achievements with respect to four midrange goals, the document has a record that is decidedly mixed. Georgian Democracy: Seizing or Losing the Chance? A year after the election that ended the rule of president Mikheil Saakashvili’s National Movement, Georgia has seen further remarkable developments that raise key questions for struggling postcommunist democracies and, indeed, democracies everywhere. Strongman Alyaksandr Lukashenka’s suspiciously lopsided 2010 electoral victory—and subsequent crackdown on dissent—may seem like a repeat of the events of 2006, but much has changed in the interval, and his regime is much more precarious today. Having thrown out a corrupt, authoritarian president for the second time, this Central Asian republic has gained a new chance at securing a real democratic transition. This is a central problem—perhaps the central problem—for classical liberal theory and its crucial distinction between the state of nature and the civil state. Which is better for liberty: nature or the state? There is no consensus about the nature of the political system in Moscow today. Yet how one understands the motivations propelling Russian policy abroad depends on how one understands its regime at home. 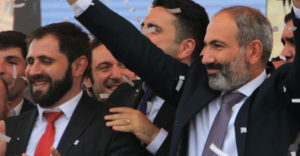 A domestic political crisis began brewing in Georgia long before the current conflict with Russia. Since the Rose Revolution, the country has been troubled by flawed elections, a “superpresidency,” and a malleable constitution.